As we become increasingly aware of what we eat, more consumers are asking questions about what they drink as well. That probably explains the visible run on natural wines we see around us. In the greater cities in our country, the number of natural wine bars and restaurants serving this product are rising fast. Interestingly, wine is one of the few food industries not regulated by conventional labelling laws. In contradiction to non alcoholic products, wine and beer producers don’t have to write all used ingredients on the label. A bizarre phenomena. In our quest to find the purest and most transparent products, we now shift focus on this category of beverages. What is natural wine, why is it so popular and what is the related design aesthetic? Together with our newest colleague, food specialist Lieke Maas, we dive into the natural-wine-scene. As a rejection to chemical agriculture in the 1980’s, winemakers in the central part of France started to work without sulfur and industrial yeast . ‘Le Baratin’ in Paris was one of the first restaurants who started serving these wines and cool enough it still is the hot spot with the most inclusive natural wine list. In the 90’s U.S. importers slowly picked up the natural scene and in 2000 the crowd grew rapidly. 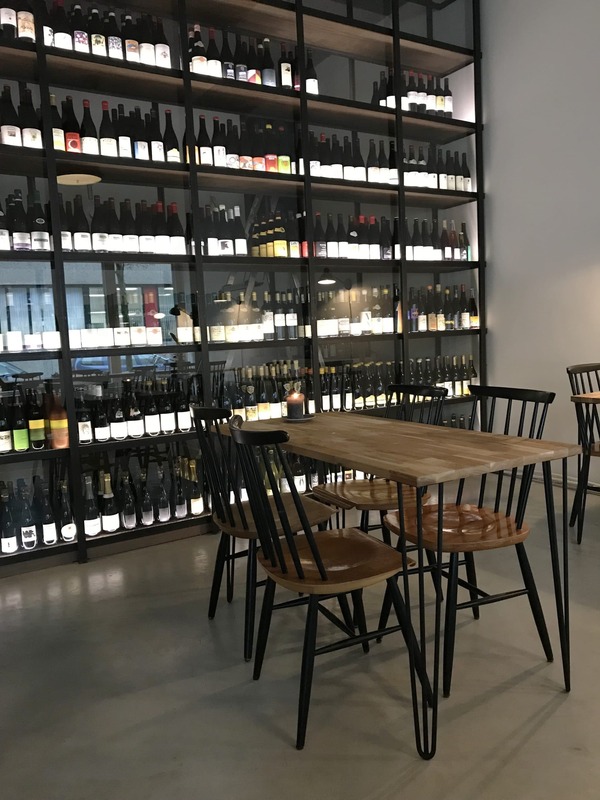 The wave reached the Netherlands 6 years ago when ‘De nieuwe winkel’ in Nijmegen, ‘Restaurant de Jong’ in Rotterdam, ‘Bak’, ‘Choux’ and later ‘GlouGlou’ and ‘Hotel de Goudfazant’ in Amsterdam founded the base of the natural wine wave. In 2017 the first natural wine salon of the Netherlands took place. ‘Vivent Les Vins Libres’ was held in ‘Hotel de Goudfazant’ in cooperation with restaurant ‘Choux’. Here purists in wine and food gathered and proved that there is a good crowd for this intriguing product. So natural became the new clean label in wines. Just like you see the same happening in food with labels like Willem & Drees. But what is natural wine? Some call it a trend, some are sceptic about the quality and some are believers. Anyhow....The later group is exploding. Is this wine automatically organic/ bio? The confusion comes with the word ‘natural’, people compare it to ‘organic’ or ‘biodynamic’ wines. In the vineyard according to the biodynamic agriculture you step away from the industrialised, manipulative, technology’s and solve problems in the vineyards using natural know-how. Based on the earliest visionaries such as agriculturalist Rudolph Steiner. So far so good. But bottled wines from grapes from biodynamic vines are not automatically natural. Natural is a philosophy and organic and biodynamic are the tools, not only used in the vines but also in the cellar. There is for example no rectification of sugars or acidity, no addition of industrial yeast and low to no filtering. Organic and biodynamic accreditation are primarily concerned with regulating the use of synthetic chemicals in the vineyard, rather than additives in the winery. Some growers use none at all. Just like in the old days. Natural wines have existed since wine was first created 8,000 years ago, it wasn’t produced using packets of yeast, sugar, vitamins and enzymes, reverse osmosis or powdered tannins. It just let the grapes and natural yeasts do their magical thing. A natural proces in which the endproduct is never safe or predictable. A result that is difficult to put into the "everything-has-to-taste-the-same" supermarket culture. The discussion about natural wine being good or bad is vivid. After having worked with natural wine for 4 years, our colleague Lieke Maas, doesn’t want to drink anything else. For her it’s about the taste; "With a ‘regular’ wine I have feeling there is less expression in the nose and the aftertaste is quite the same. I would describe the taste as ‘synthetic’ and get bored after a few swigs." In taste there are parallels with coffee. Lightly roasted coffee beans show far greater aromatic (perfume and acidity) and textural complexity (oils) when percolated rather than being exposed to quick, harsh extraction of an espresso machine. The result is a drink with a gentleness and elegance that is not dissimilar to natural wine. Natural wines tend to be lighter and more ethereal in nature. There are a lot of different styles in natural, so Lieke does understand that people tend to only smell the ‘barnyard acidity’. This happens often with lower priced bottles, so people stop drinking due to this association. But when you are used to the acidity you taste the different layers of the expression of the grapes, you really taste the possibilities of the ‘terroir’ and the expression of the maker, Lieke explains. You do need some knowledge about the winemaker and the wine to know what you should drink when. Because it’s drinking outside your present framework. Some wines are best to combine with food, which is another benefit. Due to the lightness and the layers of the wine it works good together with food. More flavours and umami can be tasted in natural wine, due to different winemaking methods natural winemakers use; for example with wines from the ‘Jura’ region. In the Jura they don’t fill the barrel while the wine ages, alcohol evaporates and oxygen will fill up the barrel which creates a ‘fungus’ layer on the wine. This together with shale and limestone in the soil makes the wine salty and rich in umami, which is really nice to pair with oysters or lobster for example. A match made in heaven! Another typical thing are the labels of natural wine bottles. You can recognise them immediately. Because ‘natural winemakers’ seem to be less interested in the official accreditation, it gives them the opportunity to express themselves freely on the label. There is a lot of art and design to be discovered but also more transparency about how much natural sulfite or sugar is added; for example with the labels of champagne maker Emmanuel Brochet, all details of the vinification proces can be find on his bottles. Most of the time the label is a visual extension of the winery and gives the vine and the specific cuve's an unique signature. It started with creative friends or family from the winemakers designing the labels. Now more people from all over the world in the creative industry work together with the winemakers. Not only do they design the labels, but they also volunteer in the vines during harvest season. Working together, drinking together and talking about wine, music and art. These are of course legendary get togethers. An iconic wine and design is the graphic on the bottles of Gabrio Bini from Sicily. It’s a simple arrow to be found on all the cuve’s, only the colours differ. Gabrio turned it into a gimmick to put the bottle in the direction of your ear. 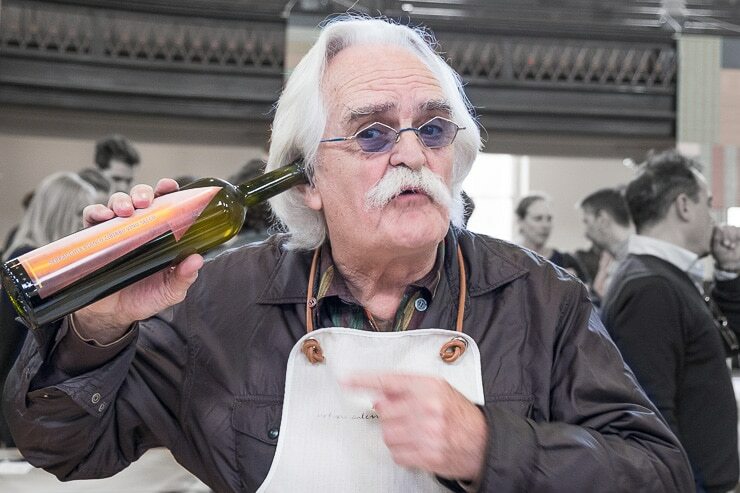 Fans followed after drinking Gabrio’s wine they picture themselves with the bottle and share it with the world. A lot of graphic & illustration designers also seem to be intrigued with Bini's bottles, they share images online of for example iconic paintings where the bottles are placed in. 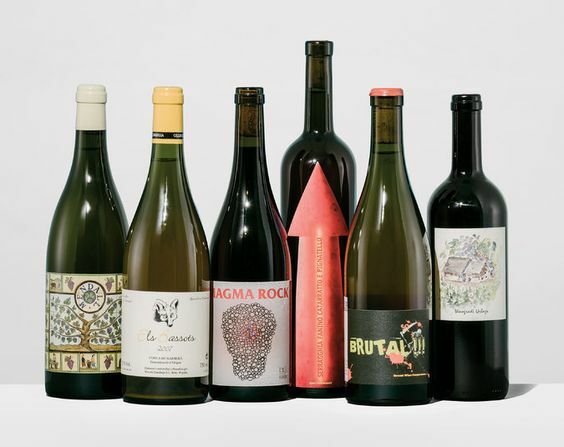 In the natural wine world the winemakers seem to have a more visual role and are more in touch with their audience and with their fellow winemakers. They share their thoughts about wine and open up their house to everyone. This also creates more transparency which is different from conventional winery’s where you are only invited to the tasting room. Lieke, while working in the restaurant scene, experienced the hospitality of the winemakers. More than once she visited winemakers at their house which most of the time ended up drinking and eating together with their families. Meeting up with Sebastian Riffault from Sancerre, he believes, besides the benefits that his wines are better understood, he and his family have to opportunity to travel the world at home, by cooking and eating together. We could say the natural wine movement not only brings more transparency, just like we now ask for with food. But it also brings people closer to the craft, making it a less snobby product. As we become more aware of the hard work which has to be put in a good, pure wine, we want to associate with the maker, this is similar maybe what happened with beer brands in the past. The design of the labels helps to give the winemakers the bigger stage they deserve, we want to keep or picture the bottles as trophy's to show our friends.